Between 1996 to 2010, land use/land cover changed in over 20% of the project area. Forest cover declined and shrub/scrub cover increased, reflecting the dominant role forestry activities play in project area land cover dynamics. 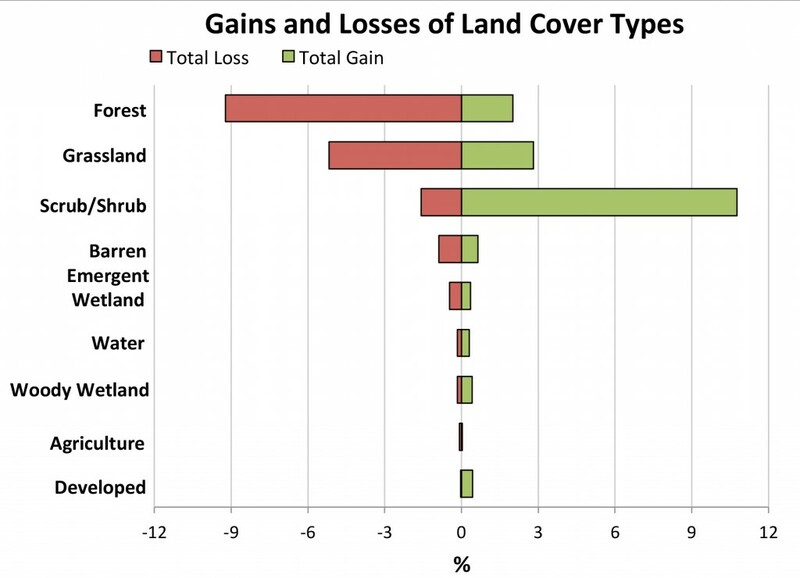 Increases in developed land came mostly from conversions of forest and grassland cover classes. Agricultural lands comprise roughly 2% of the project area; agricultural land cover has remained relatively stable since the 1990’s. 2011 distribution of each designated Land Use and Land Cover type in the project area. Red shaded areas indicate land use and cover type distribution. 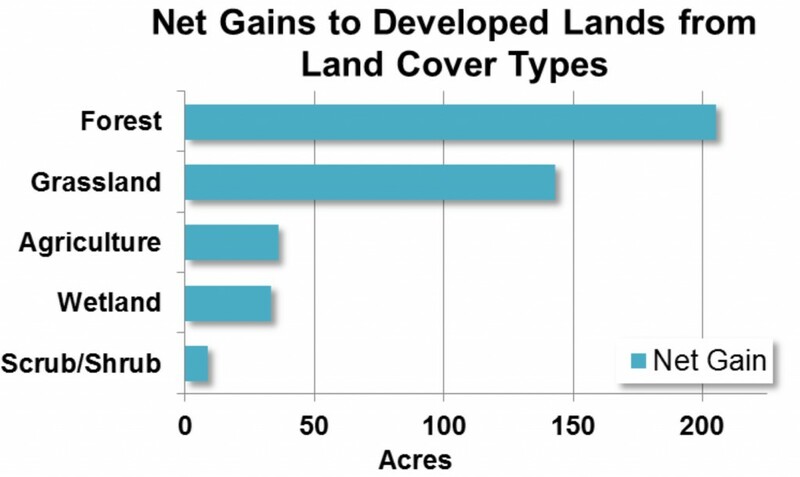 2011 is the most recent land use and cover data available. The character, extent, and status of the project area’s land uses and land cover significantly affect its environmental and socio-economic well-being. 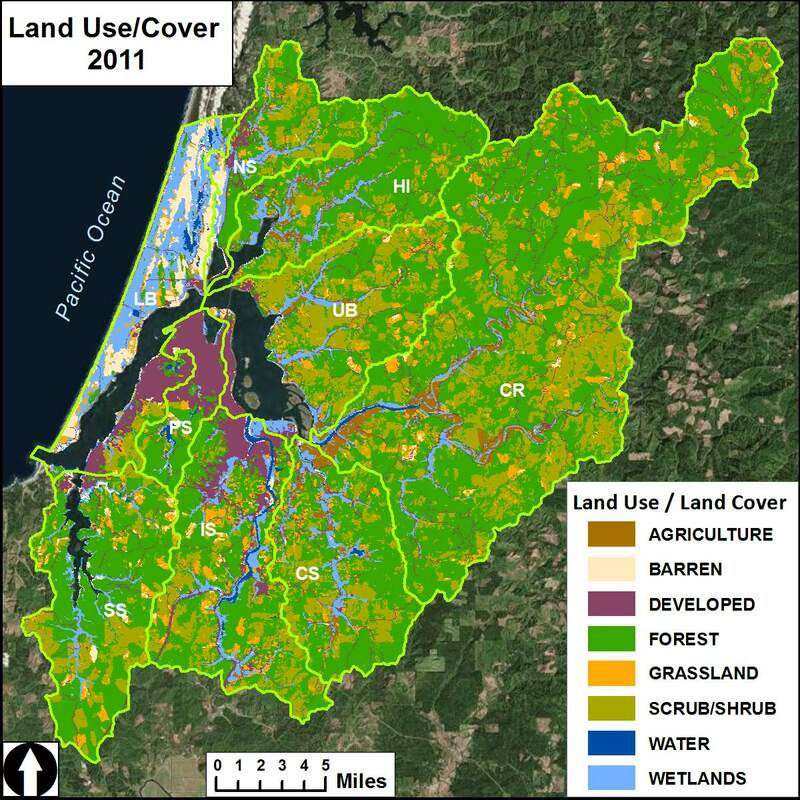 Oregon, and by extension, Coos County, through its long history of comprehensive land use planning, has tracked the status and trends of local land uses for a variety of purposes, including assessing local taxes, facilitating responsible development, and guiding sensible natural resource management. This data summary describes current land use and land cover status (first section) and trends (second section) in the project area between 1996 and 2010 based on available data. Although some land uses are commonly associated with land cover types such as forest, agriculture, or industrial, some human activities (e.g., recreation) are not directly related to a land cover. 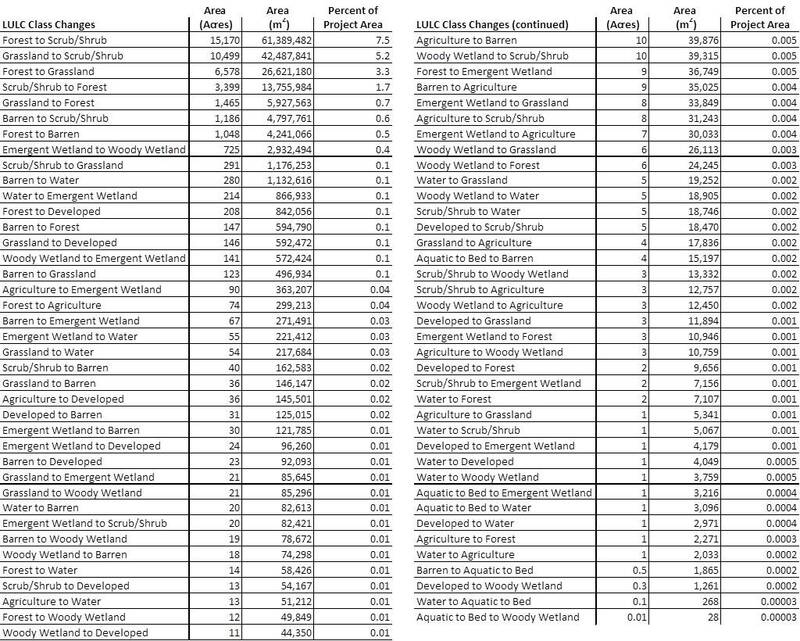 The terms land use and land cover are frequently referred to as LULC in this data summary (see sidebar). The topics discussed below include current and recent historic LULC patterns in the project area’s nine subsystems (Figure 1). Table 1 lists the LULC classes used in this data summary and the equivalent LULC classes used by its major data sources (US Geological Survey, Coastal Change Analysis Program, National Land Cover Database). Table 2 summarizes the characteristics of the datasets used in this summary. Forest, Scrub/Shrub, and Wetlands are included here as LULC classes, but readers should consult Chapter 12: Vegetation for information about project area vegetation communities. Similarly, impervious surfaces, roads, tide gates, and levees are examined in detail in separate data summaries within the current chapter (Chapter 8: Physical Description). Table 1. 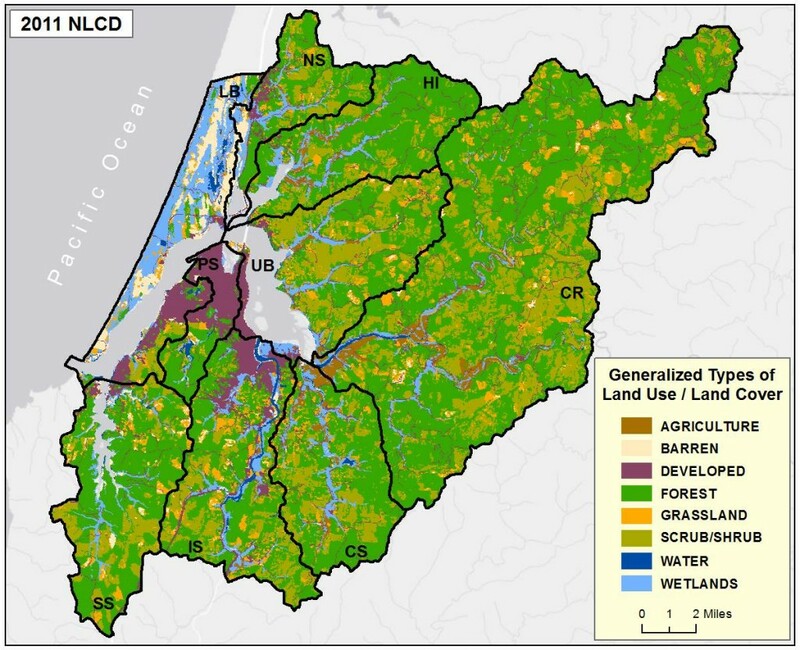 General land use and land cover types in project area and classes as referenced by data sources. Data Sources: USGS 2005; NLCD 2001a, 2001b, 2006, 2011, C-Cap 2014. * Note: The Ice/Snow class is likely an error but since its total area is so insignificant, all classes were retained “as is”. Table 2. General characteristics of major data sources used in this data summary. Table 3 and Figures 2a-2c provide an overview of the areal distribution and percentages of the LULC categories for the project area and each of its subsystems based on 2010 Coastal Change Analysis Program data (C-CAP 2014), and 2011 National Land Cover Database data (NLCD 2011) . Detailed descriptions of the LULC categories in this section are presented in the following order: Forest, Scrub/Shrub, and Grassland (land cover); Urban/Developed, Agriculture (land use); and Barren, Wetlands, Water (natural features). The C-CAP and NLCD datasets classify an area as Forest when more than 20% of the total area is covered by trees greater than 5 m (16 ft) tall. 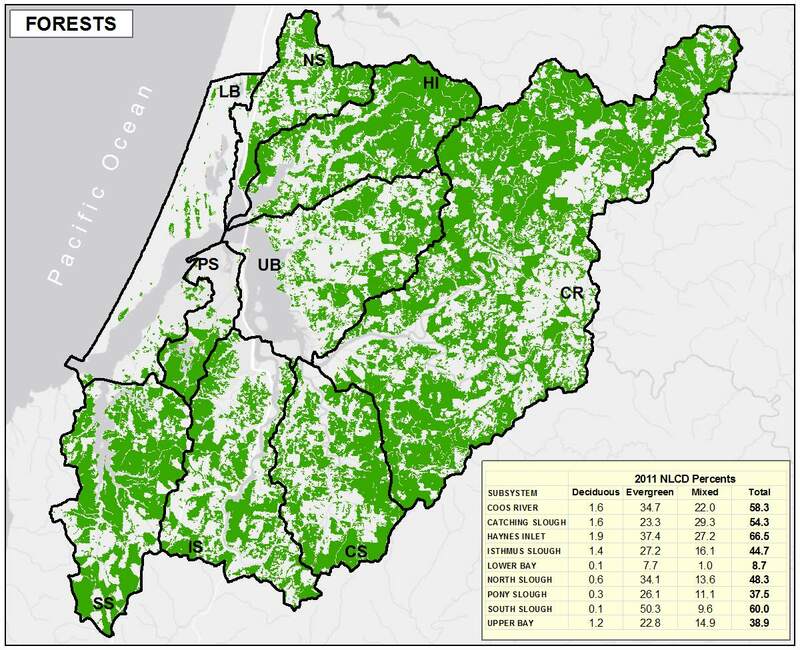 Both C-CAP and NLCD data sources are in close agreement on Forest coverage in the project area. About 50% (C-CAP: 49.9%; NLCD: 50.1%) of land cover types are classified as Forest (Table 3 and Figures 2a, 2b, 2c, 3). Forest coverage is further classified as Deciduous (C-CAP: 1.6%; NLCD: 1.2%), Evergreen (C-CAP: 30.6%; NLCD: 31.3%), and Mixed (both evergreen and deciduous)(C-CAP: 17.6%; NLCD: 18.3%). Neither data set distinguishes between natural forest and trees managed for timber production. The two data sources are also in close agreement on subsystem Forest coverage (Table 3, Figure 2a). At least 50% of Coos River, Catching Slough, Haynes Inlet, and South Slough subsystems are classified as Forest. Isthmus Slough, North Slough, Pony Slough, and Upper Bay are 30-50% Forest. The Lower Bay is less than 10% Forest. Evergreen forests are more abundant than mixed forests in all subsystems except Catching Slough, which has slightly more mixed forests than evergreen. Deciduous forests occupy less than 2.5 percent of the area of each subsystem. Scrub/Shrub areas are dominated by shrubs less than 5 meters tall and typically more than 20% of total vegetation. When forests are harvested using clear-cut methods, the re-growth of true shrubs or young trees is classified by C-CAP and NLCD as Scrub/Shrub, although very recent clear-cuts may also be classified as grasslands. Scrub/Shrub is the next most abundant land cover type for the project area (roughly 22-23%) in both the C-CAP and NLCD data (Table 3, Figures 2a, 4). Scrub-Shrub percentages range between 15-35% for all subsystems, except for Lower Bay and Pony Slough, which range between 4-6% Scrub/Shrub. Grasslands are predominately composed of herbaceous (non-woody) or graminoid (grass, sedge, rush) vegetation that is not tilled or intensively managed, but may be used for grazing (NLCD). Although grasslands are often locally associated with recently clear-cut forests and scrub/shrub vegetation, coastal dunes and other grassy environments are also represented. Note the coastal and inland distribution of grasslands and scrub/shrub in Figure 5. The percent Grassland data is consistent between C-CAP and NLCD data sources for the project area (6-7%) and among the subsystems (approximately 3-10%)(Table 3, Figures 2a and 5). Both data sources define four subclasses of Developed land, based on the percentage of constructed or impervious surfaces: High Intensity (80-100%); Medium Intensity (50-79%); Low Intensity (21-49%) and Developed Open Space (< 20%). The total percentage of land uses classified as Developed in the project area is relatively low (C-CAP: 4.45%; NLCD: 8.38%)(Table 3, Figures 2a and 6). The difference between the two data sources (NLCD’s total Developed percentage is almost twice C-CAP’s) reflects the large difference in their Developed Open Space category (C-CAP: 0.86%; NLCD: 4.50%), which appears to come from their distinctly different classification of that subclass. NLCD Developed Open Space data include large-lot housing units and uses percent imperviousness (roads, roof-tops) in its Developed Open Space classification, while C-CAP does not (Homer et al. 2004). Of the other three Developed subclasses, the greatest percentage in the project area is Low Intensity development (C-CAP: 2.26%; NLCD: 2.21%). 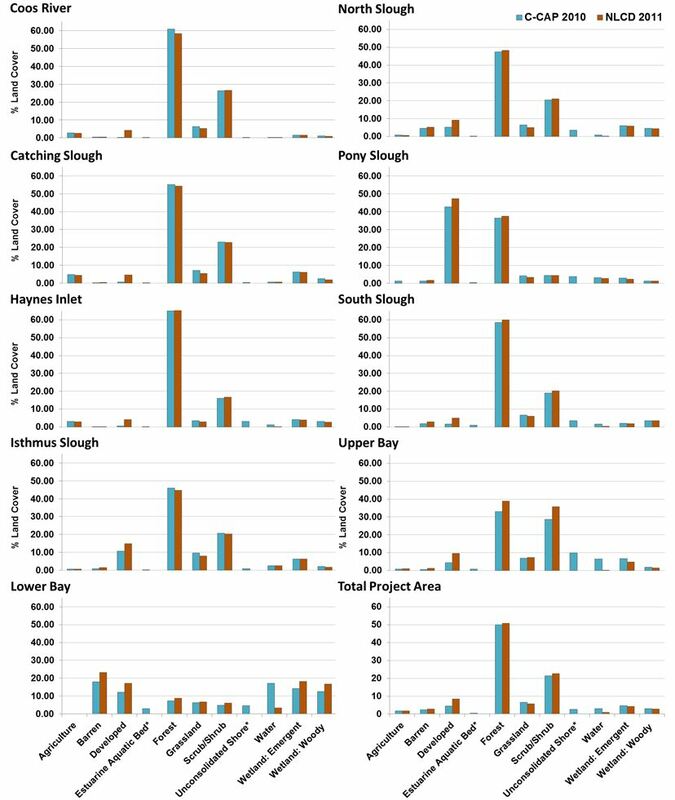 In project area subsystems, Pony Slough is the only subsystem with more than 40% developed land, Isthmus Slough and Lower Bay are about 10-20% developed, and the remaining subsystems are less than 10% developed. The NLCD data are consistently higher than the C-CAP data for all subsystems. Areas with more than 20% of the vegetation managed for crops, hay, livestock pasture or actively tilled are classified Agriculture by C-CAP and NLCD. Both sources are in close agreement on the total percentage of land uses classified as Agriculture in the project area (C-CAP: 1.84%; NLCD: 1.77%)(Table 3, Figures 2a and 7). Of the two land use subclasses comprising Agriculture, Pasture/hay is the largest component (C-CAP: 1.74%; NLCD: 1.69%). The other Agriculture subclass is Cultivated (C-CAP: 0.10%; NLCD: 0.08%). Agriculture comprises about 2.5 – 4.6% in Coos River, Catching Slough, and Haynes Inlet subsystems, roughly 0.5 – 1% in Isthmus Slough, North Slough, and Upper Bay, but near 0% in Lower Bay, South Slough, and Pony Slough (Figure 7). The Barren LULC classification consists of exposed rock, sand, or clay including local areas of exposed bedrock, sand dunes, landslides, open mines, or gravel pits. Note that C-CAP also uses an “unconsolidated shore” category that includes silt, sand, and gravel subject to inundation, which is not used in NLCD classifications (Table 3). Both data sources are in close agreement on the total percentage of areas classified as Barren (C-CAP: 2.34%; NLCD: 2.72%)(Table 3, Figures 2a and 8). 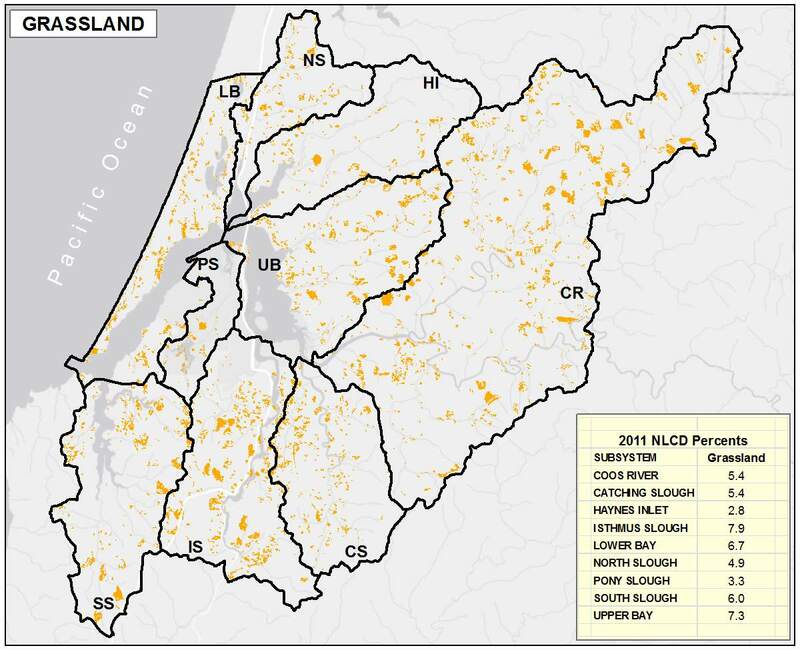 Barren land occupies about 21% in the Lower Bay subsystem (sand dunes); 2-5% in South and North Sloughs, respectively; and 0-1.5% in Coos River, Catching Slough, Haynes Inlet, Isthmus Slough, Pony Slough, and Upper Bay. Wetland classifications differ in the NLCD and C-CAP data. C-CAP distinguishes between Palustrine Wetlands (tidal and non-tidal areas with ocean-derived salinity below 0.5%) and Estuarine Wetlands (tidal areas with ≥ 0.5% salinity). Each C-CAP category is further divided into Forested, Scrub/Shrub, Emergent classes. In contrast to C-CAP’s six wetland classes, NLCD distinguished only two: Woody and Emergent Herbaceous (Table 3). Emergent Wetlands comprise 4-5% of the project area and Woody Wetlands are about 3% in both data sets (Table 3, Figures 2a and 9). Emergent Wetlands (salt, brackish and freshwater marshes) cover about 1-3% of the Coos River, South Slough, and Pony Slough subsystems, and about 4%-6% in Haynes Inlet, Catching Slough, Isthmus Slough, North Slough, and Upper Bay subsystems. The Lower Bay subsystem is about 14-18% Emergent Wetlands. Woody Wetlands (forested and shrubby freshwater wetlands) are between 1%- 4.5% of the area in every subsystem, except the Lower Bay which is about 13-17% Woody Wetlands. The Lower Bay is the most diverse of the subsystems due to significant proportions of lands classified as Woody Wetlands, Emergent Wetlands, Water, and Barren. Open water is classified by both C-CAP and NLCD as areas with less than 25% vegetation or soil. Perennial Ice/Snow is classified as Water in the NLCD but as Barren in C-CAP. For this data summary, the NLCD standard was used and the locally irrelevant percentage of “Ice/Snow” was considered Water. 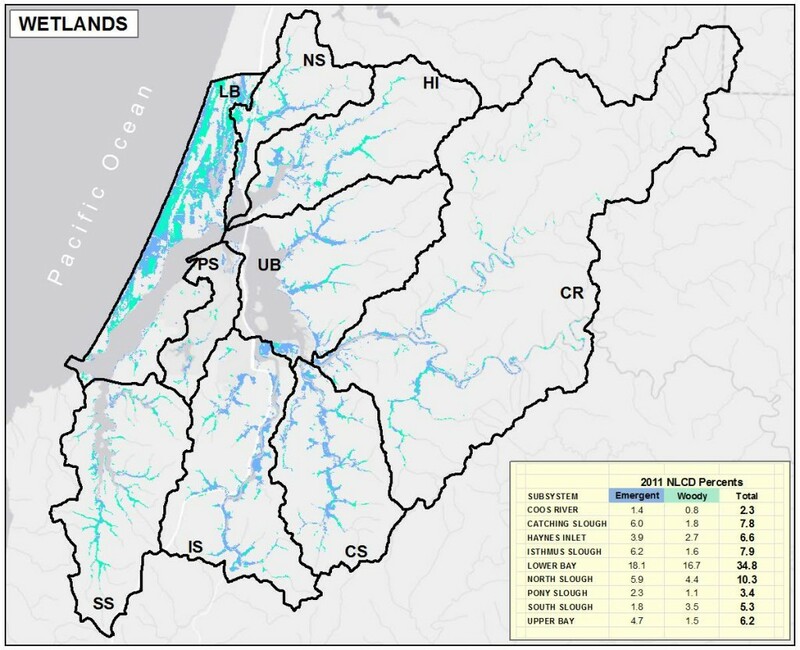 To estimate and map the percentage of the project area classified as Water we used an adjusted version of the NLCD data that partially compensates for differences between data sources (e.g., the Coos Estuary was classified as Water in C-CAP, but not in NLCD 2011 (Table 3, Figures 2b, 2c)). The adjusted data and resulting map are shown in Figure 10. The total percentage of Water in the project area is estimated by C-CAP at 3.02% (Table 3) and by NLCD (adjusted) at 5.84% (Figure 10). Figure 10. 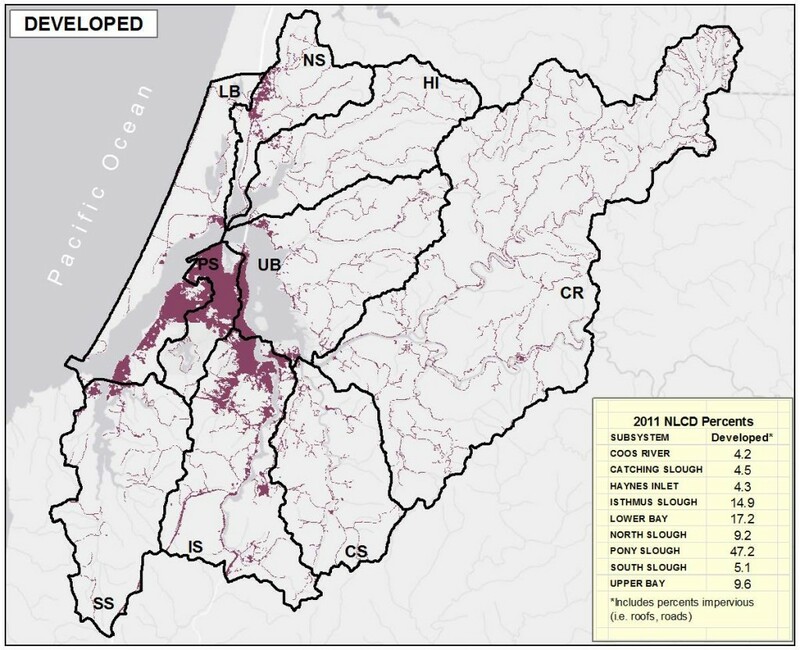 Water distribution in the project area- combining 2006 and 2011 NLCD data. Data Source: NLCD 2006; 2011. In this section, LULC changes are examined in a relatively short-term, recent interval based on the 1996-2010 C-CAP data. 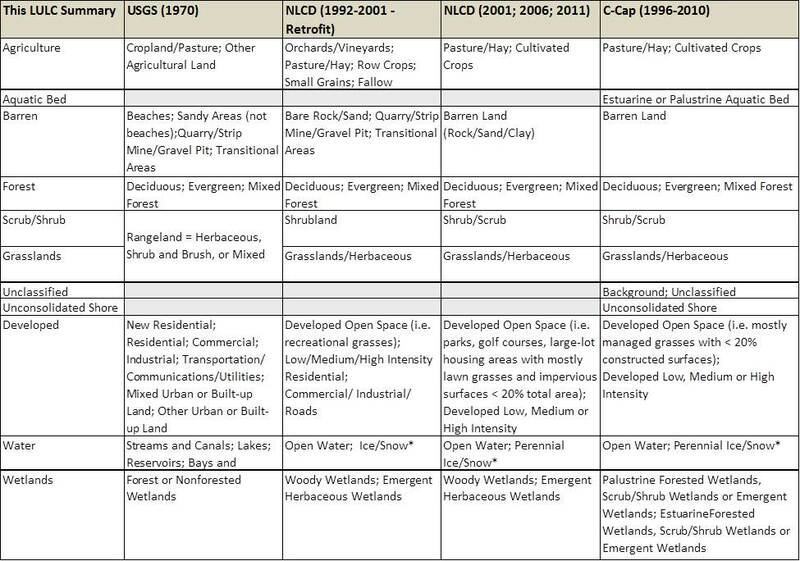 Following an overview of LULC trends in the project area and subsystems are descriptions of changes to Forest, Scrub/Shrub, Grasslands, Developed, Agriculture, Barren, Wetlands, and Water. An analysis of C-CAP data from 1996 and 2010 showed that 21.6% of the project area underwent a land cover change (68 of 315 total mi2) during that 14 year span (Figure 11 and Table 4)(for Coos County, the C-CAP atlas reported land cover changes for 21.3% of its area, thus land use change in the project area appears similar to the county as a whole). When examined individually, the greatest areal and percentage of change occurred in the Coos River subsystem, at 31 mi2 (28%), followed by Upper Bay, Isthmus Slough, South Slough and Catching Slough, each with more than 5 mi2 of land use change (approx. 20-25% change). LULC changed roughly 1-3 mi2 (8-16%) in the North Slough, Haynes Inlet, Lower Bay, and Pony Slough subsystems. The spatial distribution and percent change (relative to the total project area) of these LULC changes are provided in Figures 12 and 13 and Table 5, all of which is described in more detail in the following narrative organized by changed LULC classes. The percent of land classified by C-CAP as Forest in the project area dropped by 11.5% between 1996 and 2010. 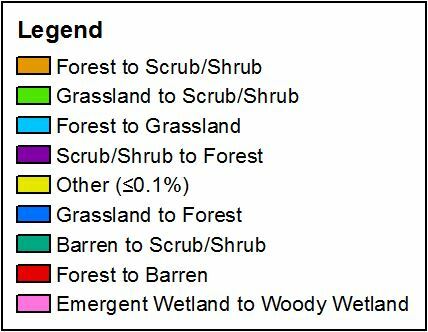 The most common change for all Forest types was from Forest to Scrub/Shrub throughout the project area (see more in the Scrub/Shrub section below). Approximately 11% of the forests in the Coos River subsystem became Scrub/Shrub between 1996 and 2010, followed by 7.7% in South Slough, 6%-7% for Catching Slough, Isthmus Slough, North Slough and Upper Bay, 3.9% for Haynes Inlet, and 0.6% in Lower Bay (Figure 14). Locally, the upland Scrub/Shrub LULC class represents transitional vegetation communities following natural disturbance events (e.g., slope failure, fire) or human activities such as timber harvest operations. In the project area, Scrub/Shrub lands increased by 36 mi2; from 10% total coverage in 1996 to over 21% in 2010 (Figures 12 and 13, Table 5). As mentioned above, the greatest shift in vegetation cover in the project area was the conversion of Forest to the Scrub/Shrub LULC class (Figure 15). Over 18 mi2 of forested lands were converted to Scrub/Shrub during the 14 year study period. For additional detail on changes in Scrub/Shrub vegetation see Grassland section below and the Terrestrial Vegetation data summary in Chapter 12: Vegetation. Between 1996 and 2010 it appears that timber harvests and likely natural disturbances created new areas of Grassland (as classified by C-CAP). Grassland gains ranged from +0.4% to 5.1% in Lower Bay and South Slough subsystems respectively (Figures 12, 13, 16, Table 5). 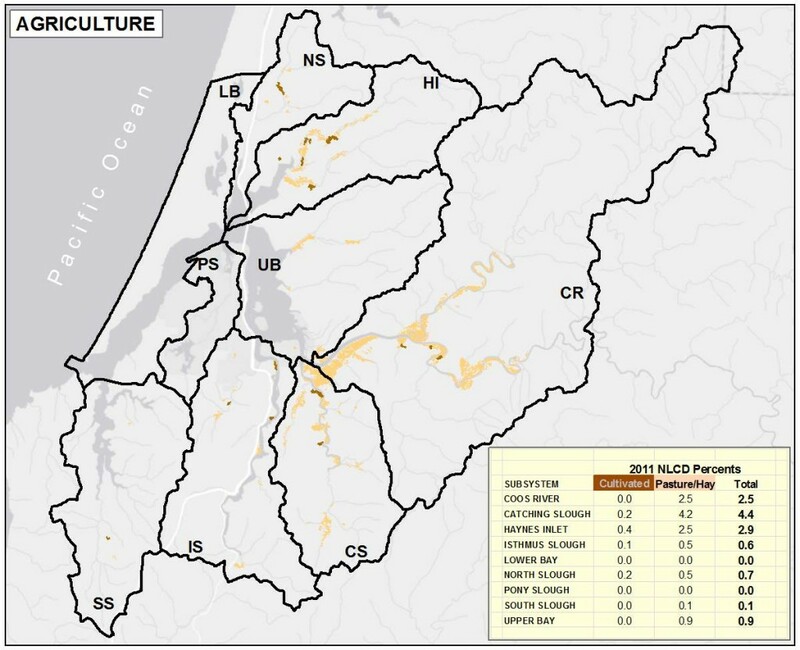 Percent Grassland losses also occurred between 1996 and 2010 in project area subsystems- mainly conversions to Scrub/Shrub LULC- as follows: Upper Bay- 7.9%; Catching Slough- 6.7%; Coos River- 6.3%; South Slough- 4.5%; Isthmus Slough- 4.4%; North Slough- 4.2%; Haynes Inlet- 2.5%; Lower Bay- 2%; and Pony Slough- 1% subsystems. Grasslands (recent timber harvest areas) appear to C-CAP as Scrub/Shrub areas when vegetation cover in those recent timber harvest areas begin to mature into young forests full of tree seedlings and shrubs. Developed land change analysis focused on three transition types: 1) non-Developed LULC classes re-classified to Developed classes; 2) changes from one Developed class to another Developed class; and 3) Developed classes re-classified to non-Developed classes. Each transition type is discussed separately below. 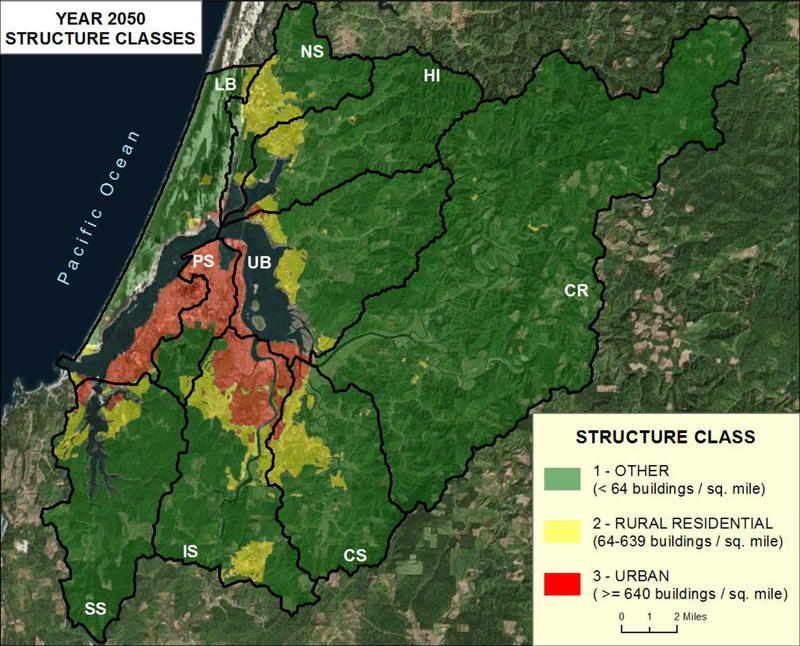 The non-Developed classes most frequently re-classified to Developed classes in the project area between 1996 and 2010 were Forests and Grasslands. Fewer Agriculture, Wetlands, and Scrub/Shrub areas were also reclassified to Developed classes (Figure 17a). The Pony Slough subsystem experienced about 121 acres (2.2% of its total area) converted from a non-Developed class to a Developed category (Figures 17b, 17c). About half the change was attributed to transitions to Low Intensity Developed, followed by Medium then High Intensity Developed. Nearly half the gains in Developed lands came from Forest conversions. In the Lower Bay subsystem, 118 acres (0.7%) were converted- in descending order of acreage- to Low, Medium, High Intensity Developed, and Developed Open Space. These were most often converted from Grassland (0.25%) or Forest (0.22%) classes. About 86 acres (0.4%) of the Isthmus Slough subsystem changed to Developed Open Space or Low Intensity Developed. Conversion primarily from Forest (0.19%) followed by Agriculture (0.11%). All the other subsystems experienced less than 40 acres (< 0.3%) change from non-Developed to Developed classes. For changes between developed classes, the subsystems fell into two groups: a) very minor changes (essentially unchanged); and b) modest changes (roughly 5-15 acres). Very minor changes were detected in the Coos River, Catching Slough, Haynes Inlet, North Slough and South Slough subsystems. Modest changes were detected in the Upper Bay, Lower Bay, Pony Slough, and Isthmus Slough subsystems. Many of the changes are characterized by normal urban growth- transitions from lower intensity Developed classes to higher intensity Developed classes. But the reverse also occurred when higher intensity Developed classes were reclassified to lower intensity classes for reasons that are less clear, though possibly explained by mapping and/or classification errors. Changes from higher intensity Developed classes to Non-Developed classes are unlikely to be real changes because development tends to be permanent (NOAA 2010). All areas that appear to change from Developed to Forest are very small (<0.33 acres) and are most likely mapping errors. However, some areas need to be investigated further including Isthmus Slough which has the largest area (19 acres) reclassified from Developed to Non-Developed classes (mostly Barren)(Figures 17b and 17c). Similarly, significant changes in the Lower Bay (10.5 acres) and Pony Slough (6 acres) subsystems bear further investigation. In all cases Barren is the most common class into which Developed classes changed (Figures 12 and 13, Table 5). All other subsystems include less than three acres changed from Developed lands to Non-Developed classes. Land use and land cover information links the socio-economic and environmental characteristics of an area by describing 1) how and where a community’s socioeconomic activities are physically reflected on the local landscape and 2) the location and extent of the natural resources most valued by the community. LULC status and trends information is critical to helping communities plan for the future by providing a foundation for discussing how land and associated natural resources will be used, conserved or restored in the foreseeable future. In this section we explain historic LULC trends and briefly discuss two models that planners use to describe future LULC scenarios. Historic LULC data are available for the project area (data sources listed in Table 2); however, since content, formats, and LULC classes were inconsistent between data sources, the effort needed to normalize and effectively analyze the data was deemed beyond the scope of this project. Since some of the historic data for the Forest class was relatively consistent across data sets, we present those findings below, with additional information about historic forest fires. This section is not intended to exhaustively describe the history of lands classed as Forest in the project area. An Oregon Department of Forestry map entitled “Forest Land and Vegetative Land cover for the State of Oregon, circa 1900” allows comparison of current forest distribution with conditions over a century ago (ODF 2000). Although the map scale is coarse (1:500,000), it provides a useful historical perspective on the distribution of the forests and associated land use practices. According to this map, the Catching Slough subsystem contained about 71% Forest and 29% Woodland while the Isthmus Slough subsystem contained about 57% Forest and 9% Woodland. 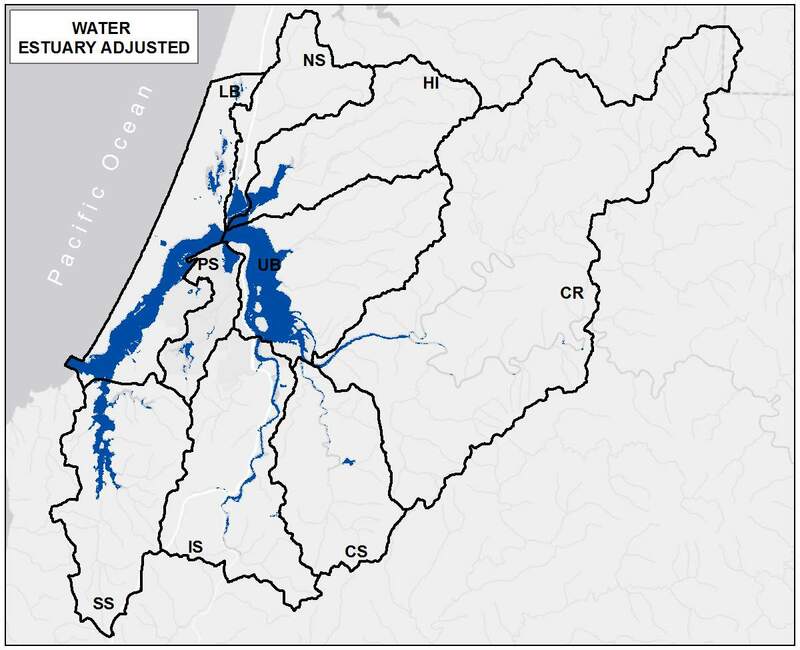 Forest and/or Woodland comprised roughly 30% to 40% of the Coos River, Pony Slough, and South Slough subsystems, but were less than 10% of the North Slough (7%), Upper Bay (3%), Lower Bay (1%) and Haynes Inlet (0%) subsystems. Coos River was the only subsystem with a significant proportion (11%) of cut timber that was not being restocked in 1900. See Table 6 below for Forest coverage in the project area from “pre-settlement” times (1880’s) to 2011. In 1900, Catching Slough was the only subsystem without burned areas (Table 6). According to Zybach (2003), the classification of burnt areas on Oregon Department of Forestry’s 1900 map was intended to represent “nearly or complete” timber destruction and areas only partially destroyed by fires were not included. According to the map, the burnt class covered 65% of the Haynes Inlet subsystem. Burned areas were also extensive in the Upper Bay (60%), North Slough (56%), and South Slough (46%) subsystems, and present to a lesser degree in the Coos River (24%), Pony Slough (22%), Lower Bay (21%), and Isthmus Slough (19%) subsystems (Table 6). Figures 23a (top) and 23b (bottom). Projected distribution of population (23a) and land cover types (23b) in year 2050 according to the “Protect Agriculture and Forest” scenario. Data Source: ODF n.d. The terms “land use” and “land cover” are frequently used interchangeably because they are closely related. Land use focuses on human activities and often has management or zoning connotations whereas land cover describes the natural or constructed materials on the land surface. The distinction can be important because land use and land cover data were frequently developed separately, for particular purposes, and with different methods and resolutions, thereby leaving gaps and inconsistencies for users. Although many human activities are associated with a particular land cover (e.g., agriculture), some activities are not exclusively associated with a specific land cover type. For example, hunting is a common recreational land use but where it occurs could be in forest, range, or agriculture land cover classes (Anderson et al. 1976). Lands classified by C-CAP as Agriculture experienced a net loss of 59 acres in the project Area (0.3% of total area). The greatest loss was detected in the Isthmus Slough subsystem (Figure 18). However, interpreting specific changes to and from Agriculture may be confounded by classification errors. The net loss of areas classed Agriculture from 1996-2010 can mostly be attributed to conversions to Wetland (92 acres) and Developed (36 acres) classes. In some instances, herbaceous wetlands converted historically to agricultural uses may later have been intentionally (through restoration actions) inadvertently allowed to revert once again to wetlands. In addition, lands classed Agricultural can, under specific circumstances, be converted to residential land uses. In the project area, lands classed by C-CAP as Barren changed minimally between 1996 and 2010. 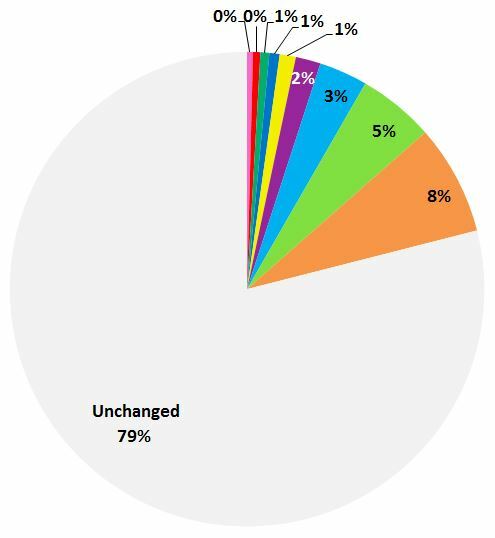 For example, the largest net percentage change from Barren land to other LULC classes was 1.3% in the Upper Bay subsystem followed by the Lower Bay subsystem (1%) (Figure 19). The Pony Slough subsystem experienced a 1% net gain in Barren lands. 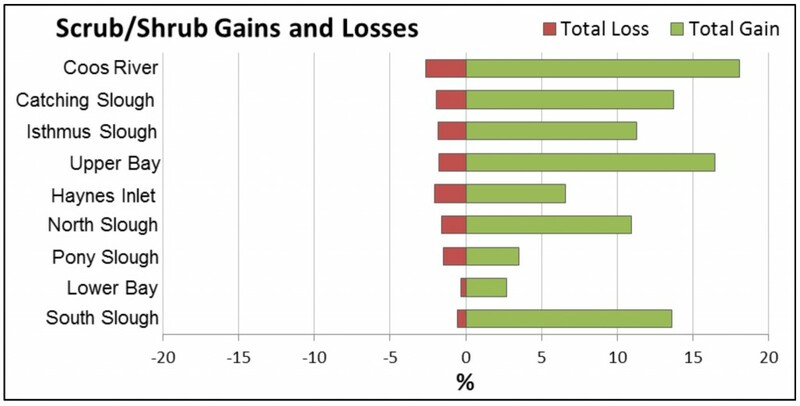 The net gains and losses for lands classified as Barren were less than 1% for all other subsystems. 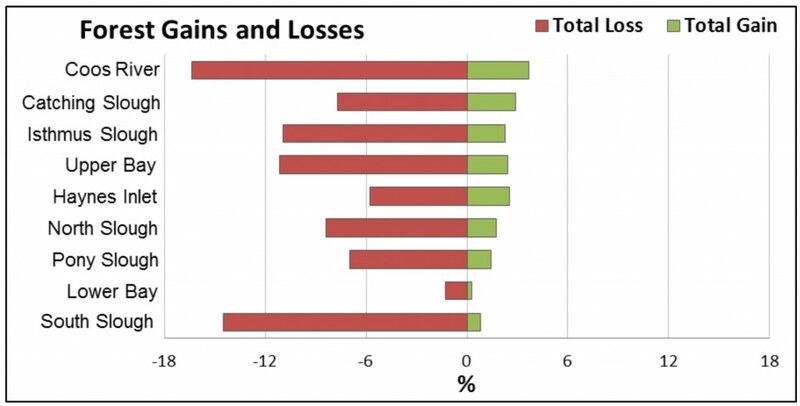 The percentage of gains and losses in lands classified by C-CAP as Emergent Wetlands were generally very small, and varied across the subsystems (Figure 20a). The changes detected were so small that they may be classified as “noise” rather than actual changes in Emergent Wetland area. 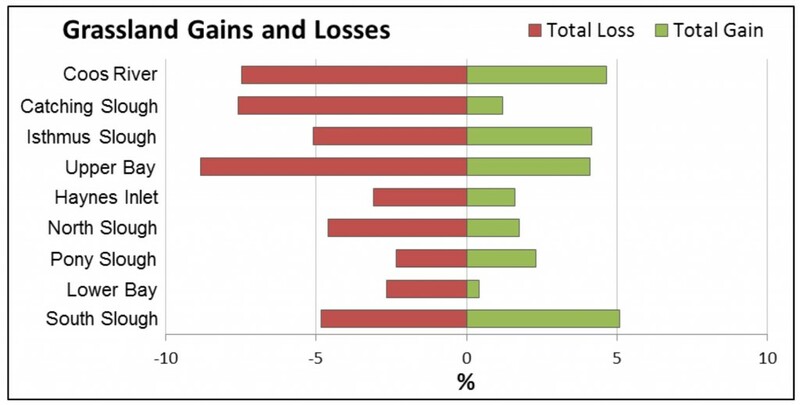 Detected “changes” included net gains in the Lower Bay (1%), Isthmus Slough (0.4%), and Pony Slough (0.2%) subsystems; and net losses in Haynes Inlet (-1%), Catching Slough (-0.7%), Upper Bay (-0.5%), and smaller losses in the remaining subsystems. Most of the changes appeared to be attributable to transitions from the Emergent Wetland class to the Woody Wetland class (Figure 20b). However, without additional information, it is impossible to reliably determine if these apparent changes are real or simply artifacts of the mapping process (i.e. classification errors, or improvements in classification technology over time). Although our change analysis detected 426 acres of the project area reclassified to Water and 244 acres reclassified from Water to other LULC classes, these changes represent very small percentages of the total area and may be spurious. Given the dynamics of the tides and the length of the Coos estuary’s shoreline, it’s not surprising that the apparent gains and losses from the Water class appear mostly in the Barren and Wetland classes. Only the Pony Slough subsystem appeared to experience an apparent change approaching even 1% (Figure 21). Again, different map characteristics and classification techniques between 1996 and 2010, are feasible explanations for the small shifts between Water and other LULC classes. For interested readers, Zybach (2003) also notes that two large fires were represented in the General Land Office surveys of the late 1890’s upon which the 1900 map was based. The Millicoma fire (circa 1765) was likely caused by indigenous people but settlers probably caused the Coos fire of 1868. Both are classified as “catastrophic fires”, covering more than 100,000 acres of contiguous forest land during a single event. Use of fires to change local wildlife habitat and provide foods for indigenous peoples is well known. However, fires were also important for the development of dense, even-aged stands of second-growth Douglas fir that promoted the timber industry in later years (Zybach 2003). Historic forests from “pre-settlement” times are shown on the map, “Oregon’s Historic Vegetation (1938) – reclassified to functional type” (Tobalske and Osborn-Gowey 2002). It is a moderate-scale map (roughly 1:100,000) created by merging data from several sources and approximates the potential natural vegetation of that period. Based on this map, in its natural state, the Coos River subsystem was 92% Forest, remaining relatively unchanged through the 1970’s (95% forest)(Table 6). The percent of Forest cover in the Coos River subsystem declined quickly between the 1970’s and the 1990’s, then more slowly in subsequent years, to about 58% in 2011. This same pattern of stability in Forest cover until the 1970’s followed by rapid change is reflected in many other project area subsystems: Catching Slough, Haynes Inlet, Isthmus Slough, North Slough, and South Slough. For the Lower Bay, Pony Slough, and Upper Bay subsystems, a higher degree of change in Forest cover occurred between pre-settlement and 1970’s time periods (e.g., the estimated percentages of pre-settlement forest areas were 14-32% larger than forest percentages in 1970’s for these subsystems). It should be noted that these differences may well be actual changes but could also be attributable to mapping inaccuracies. Table 6. Changes in historic Forest cover. Subsystems: CR- Coos River; CS- Catching Slough; HI- Haynes Inlet; IS- Isthmus Slough; LB- Lower Bay; NS- North Slough; PS- Pony Slough; SS- South Slough; UB- Upper Bay. Data Sources: Tobalske and Osborne-Gowey (2002), ODF 2000, USGS 2005, NLCD 1992, 2001, 2006, 2011. A brief discussion of two models that seek to portray future changes in land cover is provided for interested readers. Both models assume human population growth and conversions of natural landscapes to residential or other urban purposes are among several socio-economic and environmental factors expected to influence the distribution of land cover types and the rate of change in the future. It should be noted that the models are designed for relatively large areas (i.e. county, ecoregion), larger than the size of the project area. Each model simulates conditions for multiple time frames, but for convenience, only a single year (2050) is presented here to illustrate each model. The Coastal Landscape Analysis and Modeling Study (CLAMS) developed an empirical model of building density (structure counts) for the Oregon Coast Range Mountains. The goal of the model was “to place current and future forest policies in an appropriate socioeconomic context by accounting for the future distribution of humans throughout the study region” (Kline et al. 2003). Although discrete categories of Forest and Developed lands were historically used to identify the presence or absence of humans, this model reflected a continuum of human habitation on Forest land. Photo-point observations of building density on non-federal lands from 1974, 1982, and 1994 were used to characterize the dispersed conversion of forests to low-density development (Kline et al. 2003). In addition, information on slope, elevation, land use zoning, and “gravity indices”, which describe the spatial diffusion of human populations, were used to develop an empirical model. Future building densities are computed by combining the CLAMS model with projected changes to the gravity indices and building densities. As an example of the model output for our project area see Figure 22, which was created by applying the projected gravity indices and building densities to a 1995 map as the base year and extended to 2050. 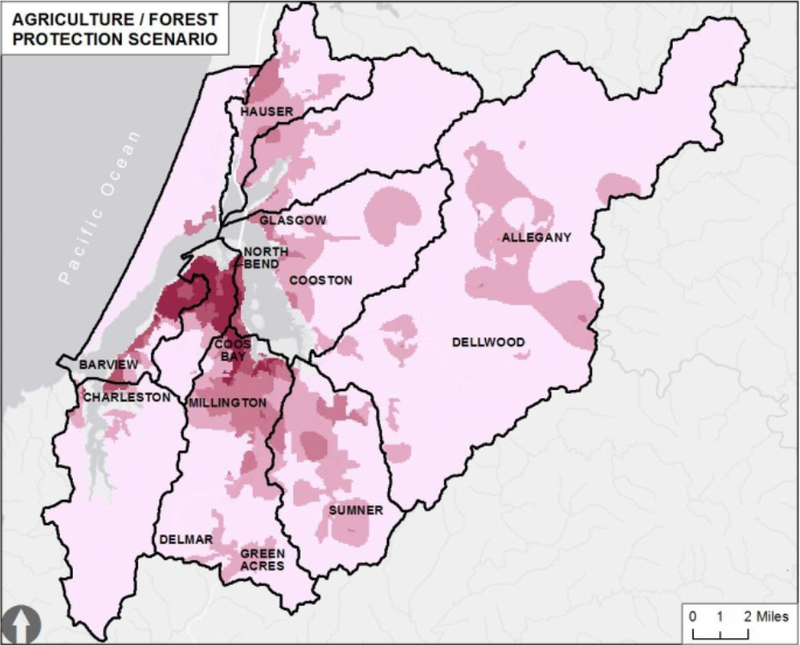 Another model, created by the Oregon Department of Forestry, illustrates the amount of Forest, Agriculture, or Range (Grassland and Scrub/Shrub LULC classes combined) lands that could become low-density residential or urban land to accommodate an additional 2.5 – 3.0 million people in Oregon by 2065 (ODF 2014, n.d.). This model allows users to change variables and assumptions to create alternative growth scenarios and examine the potential outcomes of land management decisions. The model identifies where growth would likely occur in each county based on 12 spatial data layers including recent land use, population, expected population increases in five-year intervals (using projections from the U.S. Bureau of Census and Portland State University Center for Population Research), slope, land ownership, management intentions, urban growth boundaries, and proximity to roads or currently developed areas. 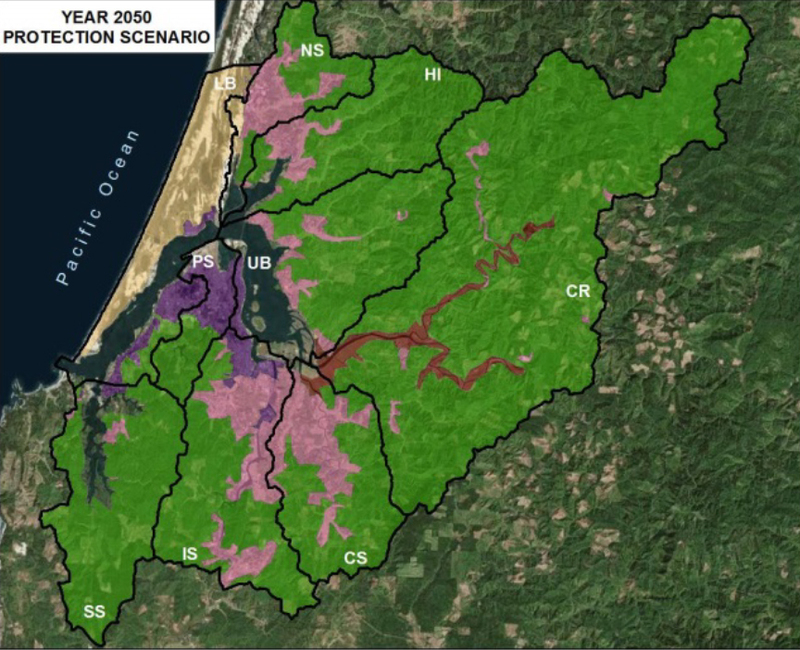 It projects the 2009 land use classes from “Forests, Farms, and People – Land Use Change on Non-Federal Land in Oregon 1974 – 2009” to the year 2065. The model provides three scenarios for increasing developed land: 1) “Grow-up” or “in-fill” where population density is increased only in areas already developed or within an urban growth boundary; 2) “Grow-out” conversion of forest, range, or agricultural land anywhere; and 3) “Protect Agriculture and Forest”, which limits resource land conversions and approximates current land use regulations. Figures 23a and 23b display the projected population and development areas according to the “Protect Agriculture and Forest” scenario for the year 2050 in the project area. Homer, C., Huang, C., Yang L., Wylie, B., and Coan, M. 2004. Development of a 2001 National Land Cover Database for the United States. Photogrammetric Engineering and Remote Sensing, 70 (70): 829-840. Kline, J.D., Azuma, D.L., and Moses, A. 2003. Modeling the spatially dynamic distribution of humans in the Oregon (USA) Coast Range. Landscape Ecology, 18:347-361. Oregon Department of Forestry (ODF). n.d. [Model Outputs for Future Development, GIS data]. Available upon request from ODF GIS Program.